A total lunar eclipse is seen as the full moon is shadowed by the Earth on the arrival of the winter solstice, Tuesday, December 21, 2010 in Arlington, VA. From beginning to end, the eclipse lasted about three hours and twenty-eight minutes. The longest total lunar eclipse since July 2000 will occur on Wednesday (June 15), with skywatchers in Europe, Asia, the Middle East, Africa and Australia in prime position to witness the moon treat. The event is the first lunar eclipse of 2011 and one of two total lunar eclipses this year. The eclipse, which will occur during June's full moon, will begin at 1:24 p.m. EDT (1724 GMT) and last until 7 p.m. EDT (2300 GMT), but it will not be visible from North America. For observers in regions where it will be visible, the eclipse could offer an amazing sight: the period of totality will be 100 minutes. In the last 100 years, only three other eclipses have rivaled the duration of totality of this eclipse, according to SPACE.com's skywatching columnist Joe. Rao. The last lunar eclipse of similar length occured on July 16, 2000 and lasted 107 minutes. 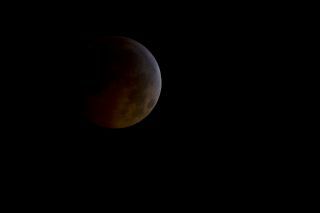 "From the Earth, the moon will appear to darken and turn a deep red before eventually returning to normal," explained NASA officials at the agency's Goddard Space Flight Center in Greenbelt, Md., in an advisory. "When light from the sun goes by the side of the Earth, it passes through a long and thick layer of Earth's atmosphere. Shorter wavelengths of sunlight, like blue, are scattered by the atmosphere, so by the time the light has finished its trip to the moon, more of the longer wavelengths, like red, are left over. On the Earth, the same thing happens at sunset as the ground you stand on gradually passes into night." Unlike their solar counterparts, lunar eclipses are safe to view without any special protective glasses or equipment. According to NASA's eclipse website, Wednesday's total lunar eclipse will be visible during its peak to skywatchers throughout Europe, with the exception of Scotland and northern Scandinavia. In eastern South America, Western Europe and the west coast of Africa, the eclipse will occur Wednesday evening, according to Rao. Skywatchers in eastern Brazil, Uruguay and Argentina have a chance to see the lunar eclipse during its total stage, NASA officials said. But for some countries, the event will be visible in the wee hours of Thursday (June 16) because the eclipse's region of visibility crosses the International Date Line. The early Thursday viewing times apply to observers in central Siberia, eastern Mongolia, northeast China, and most of Japan, Korea, New Guinea, eastern Australia and New Zealand, Rao explained. "Eastern Asia, eastern Australia, and New Zealand will miss the last stages of eclipse because they occur after moonset," the NASA Eclipse Website advisory stated. Wednesday's lunar eclipse is part of a rare three-eclipse series of events occurring in June and early July. It follows the June 1 partial solar eclipse and comes before another partial solar eclipse, which will occur on July 1 but only be visible from a remote region near Antarctica. The second lunar eclipse of 2011 will occur on Dec. 10 and will also be a total lunar eclipse. That even should be visible from the western United States and Canada.